Vigilantes were forced onto the streets last night to protect their homes and businesses after police failed to materialise at many of the scenes of looting and violence which swept across London. As officers lost control of the streets locals were forced to take the law into their own hands, arming themselves with sticks and chasing looters away from their properties. On Shacklewell Lane, the Turkish community was hailed across Twitter as being the force which saved the area from wanton destruction. After a single-deck bus was burned out, stick-wielding shopkeepers chased away a gang of youngsters before standing defiant in the face of further violence. In testament to the men's bravery, several businesses on the street remained open as usual, unlike other areas where shopkeepers had heeded police advice to shut their doors early. South of the river in Tooting, near to Clapham, where high streets were ravaged, Asian shopkeepers shut up early and stood guard outside their stores with their relatives to protect them. In parts of London, ethnic communities joined forces to drive the looters and muggers off the streets. 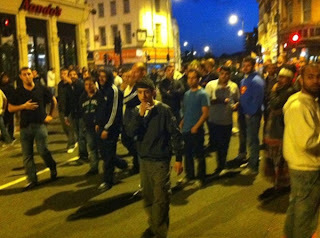 In the large Turkish community in north London's Dalston, young Turks chased off would-be looters, and not far away in east London's Whitechapel district, young Muslim men stood guard over a mosque. A similar incident was reported in the Old Kent Road area of London, where young Muslims were out on the street to deter thieves and robbers. In Whitechapel looters attempted to break into the Islamic Bank but were chased off by incensed worshippers who saw what was going on as they left evening prayers at the East London Mosque. Muslim youths were last night guarding the bank.